This entry was posted in Favorite Perfumes, My Stats and tagged Amouage, Annick Goutal, Antonia, Bronze Goddess, Chanel, Dior, Estee Lauder, Frederic Malle, Heure Exquise, Iris Poudre, Jeux de Peau, Jo Malone, No 19, No 19 Poudre, Ormonde Jayne, Puredistance, Serge Lutens, Sonoma Scent Studio, Ta'if, Tauer Perfumes, Tiare by Ormonde Jayne, Tom Ford, Une Rose Vermeille. Bookmark the permalink. ← Happy New Year 2012! Undina, your databases are the best! You have inspired me to start using Bento. I’m sure I won’t be able to do all these cool things you’re doing with it, but one has to start somewhere, right? I ADORE your most popular brands chart. This is just priceless!!! Thank you, Warum. 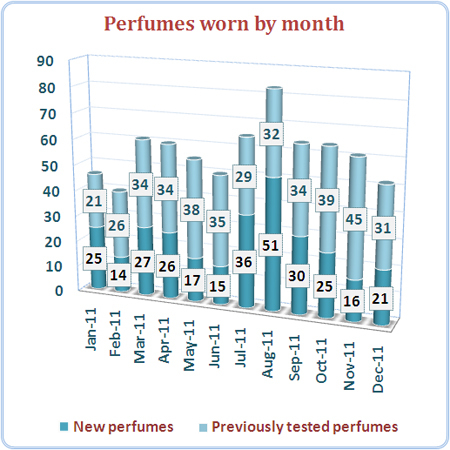 I think you’ll find it’s fun to be able to look at your perfume habits through agregated numbers. Just do it to the extent where it’s not a job yet – and later, if you want more, widen your data. Happy new year Undina, and thank you for the link! Happy New Year to you too, Dee! I have to admit, I’m especially proud of this one: after I had an idea, it took me some time to implement the proper scaling. Have you noticed that your “goddaughter” is on the fifth place among perfumes I wore the most? Thanks, Birgit! You’re my inspiration in so many aspects that I’m glad to be useful in any way. Congratulations on keeping your perfume resolution for all 12 months of the year, Undina! I have definitely realised the benefits of wearing my full bottles on a regular basis over the last few months. I was surprised by the 110 different brands but that’s the kind of thing we just don’t realise unless we keep stats. Like others I love that brand graph with the bottles! Tara, you can’t imagine how surprise I was when I saw the calculation! I checked twice. There are 140 brands in my database now, so I haven’t even used all of them last year. Brands graph is my favorite, thank you. Thank you, Natalie. It’s hard to maintain the same enterntainment level but I’ll see what I can come up with. You are so organised with your stats that I find it hard to imagine there could possibly be lost bottle openers and clothes pegs rattling around in your catch-all drawers… I love Tiare and Ta’if and am happy that you enjoyed wearing them quite a few times too. And you are a big iris fan, I see! Ta’if is one of my most favorite perfumes ever! And Tiare is my best friend (whom I did take on a tropical vacation, I as promised). As to the iris, that was one of the discoveries I made analyzing data. Not that I wouldn’t have realized it without a database but it just made it obvious. So, beyond the obvious, do these numbers reveal anything else to you about your fragrance choices? Thank you, Joanne. It’s not that much of a discipline but a way to control my mild form of an OCD. The most useful conclusion from analyzing data is: I spent too much money on buying samples and too little time on testing them. I’ll try to correct that. Your conclusion is also an issue for me. I have many samples laying around that are barely used. Green florals seem to a favorite of yours! Thank you for introducing me to the wonderful Heure Exquise. I think I might like it a leetle bit more than vintage No. 19 (Edt). Oh and hope you are having a wonderful new Year! Lavaanya, you’re welcome. I’m glad you liked it. I’ll have soon another one for you to try: I think you might like it as well. And yes, green florals have a special place in my heart, as I learned during the last year. The year has started busy but quite nice, so I hope it goes like that for another 11 months. I love your databases – they make me happy! Thank you, Carol! I’ll try to think of more fun things to do with my stats.